Tripp Lite's USB to Parallel Printer Cable (USB 1.1) provides the convenience of connecting a parallel device such as a printer to a computer through the USB port. Just plug it in and the driver installs automatically; no need for a software CD. Perfect for systems without a parallel port or when the existing parallel port is needed for another device. The 10-ft. cable features nickel-plated connectors and gold-plated copper contacts for superior conductivity. The cable is manufactured with molded connectors and integral strain relief for extra durability and long life. Double shielding provides maximum EMI/RFI protection. USB-A male to Cent36 male. 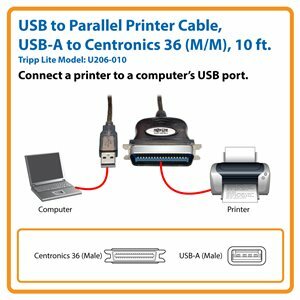 The Tripp Lite U206-010 USB to Parallel Printer Cable (M/M) is ideal for computers without a parallel port or when the parallel port is already in use. This USB 1.1 cable allows you to connect a parallel device, such as a printer, to your computer’s USB port. Just plug it in, and the driver installs automatically with no software CD required. It’s compatible with Windows®, Mac® and Linux®. The 10-foot molded cable features premium foil and braid shielding to deliver top-of-the-line signal quality and protection from EMI/RFI interference. Nickel-plated connectors with gold-plated copper contacts ensure excellent conductivity. Integral strain relief ensures the cable and connectors last a long time. The U206-010 comes with a lifetime warranty. It’s manufactured in compliance with strict RoHS specifications, reflecting Tripp Lite’s commitment to environmental responsibility. USB to Parallel Printer Cable, USB-A to Centronics 36 (M/M), 10 ft.